The Strauss deal for the next few weeks is 30% of all ma’adanim- Milky, Gamadim, Dani, etc. when you buy 30 shekels worth at Shufersal. Click here to get your deal sent to you! Click here to like Loreal’s Facebook page and print a coupon for 10 shekels off L’oreal Casting Creme Gloss hair color. No, this post isn’t food related, but I can’t resist- I must have been bitten by Olympic fever- have you? If watching the Olympics makes you consider a journey to England, The Lonely Planet is offering the Stratford and East London section from their England travel book for free! It is updated for 2012. This free pdf is offered through The Book Depository, and online bookseller based in England with free shipping to Israel. If you prefer to access the link directly from The Book Depository, click here. If you are already in England, why not travel over to France? Lonely Planet is also offering a mini-ebook “Cycling in the Pyrenees” through The Book Depository. Click here to downlod the pdf. Use this coupon to get free shipping from Mega Ba’internet when you spend 180 shekels or more. Zoglobek “Temani Malawach” 700 gm (Bar code 7290006741387)- use by date of 13 Jun 2013- erroneously has cheese burecas in package. The product is acceptable for use. Tnuva “Aged Frozen Imported Argentinian Eye Steak (Bar code 7290000638720)- manufactured Mar 2012, use by date of Mar 2013- may be spoiled. 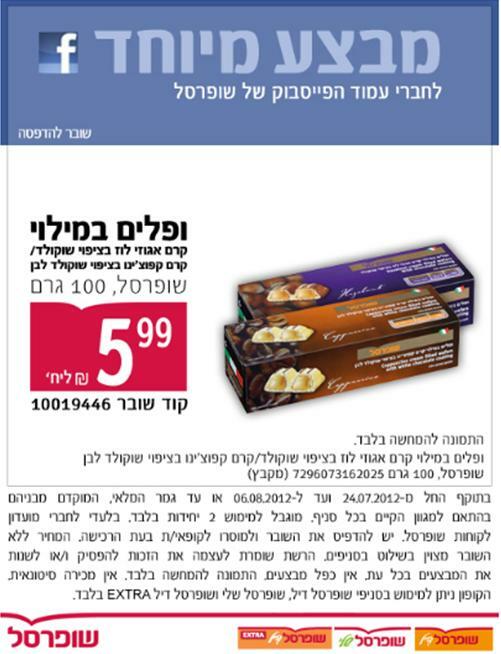 Strauss Ice Cream “Max Hafta’ot” (vanilla/chocolate flavored ice pop)- expiration dates of 22-23 Nov 2013- possibility of Salmonella bacteria. Super Drink “Sail Pure Drinking Water”- expiration date of 11 Jan 2013- possibility of Pseudomonas aeruginosa bacteria. Shufersal mushroom soup double pack (Bar code 7296073143284)- expires 10 Oct 2012 sidra 11283- presence of dairy ingredients. The product is safe to eat. Of Tov “Thin Shnitzel with chips breading” (Bar code 729000150420)- expires 10 Oct 2012- possibility of plastic pieces. Ma’abadot Rafa “T-GO” (natural product for teething pain in babies)- consumer complaint. Pillsbury baking mixes (Codes 0-1800070122-3, 0-1800070349-4, 0-1800070351-7)- expires 10 June 2012- 20 Aug 2012- possibility of plastic pieces. Anlit “Yumi Multi Vitamin Plus” (Batch code 340043011)- expires June 2013- presence of peanut oil. I posted all recalls of products that still haven’t expired, even though the notice might not have been advertised recently. Check your shelves! Have you seen the new Ministry of Health? Their web site, that is. Finally, on par with other countries around the world, Misrad HaBriut has put a Recall section on their web site. It is located in the Food and Nutrition section, along with relevant legislation and information about various topics, in Hebrew. There is a limited section in English if needed. I will add this link to my blogroll and in my next post I will sum up the most recent recalls, but I recommend you check it every once in a while, as well as request that your local newspaper carry these recalls- people need to be made aware of them! Click here to get a free e-cookbook from Starkist (Israel). Although it isn’t easy to get through a Hebrew cookbook, I really try because the recipes are more appropriate to Israeli ingredients and equipment. Tuna is very rich in protein (27%), is high in nutritional value like milk, chicken and beef, and also low in calories. Tuna preserved in oil contains 10% fat, mostly vegetable, and also contains omega-3 oil, a healthy fat which reduces cholesterol and lessens the risk of heart attacks. Tuna preserved in water has a specially low percentage of fat – 1%, and contains the same amount of omega- 3 healthy fat. Light tuna is fished in the deep ocean (rather than near the shore) and contains exceptionally low levels of mercury, 10 times less than that allowed by the Israeli standard. The tuna is preserved without artificial preservatives using only natural materials. The American FDA recommends eating at least 340 gr. light tuna a week, and also notes that eating tuna once a week or more is likely to reduce mortality from CHD (heart attacks). The Company has worldwide exclusivity in producing products using Sea of Galilee sardines which contain more than twice as much calcium as regular sardines. Did you know that the Starkist products sold here are produced in Israel?? Yes, I DID say Rosh Hashana shopping! Erev Rosh Hashana is Sunday, September 16. That is only 3 weeks after the kids are back at school. I know that it is a hard time to start thinking about shelling out money, what with kaytana, school books, etc., but it won’t get any easier if you buy it all at once in September. Some things you shouldn’t buy now, like gefilte fish- that is always a loss leader. Other things you can stock up on. For example, we use spinach as one of our simanim, and we go through a lot of spinch burecas. I picked up our favorite brand of burecas today at 2/30 shekels at Rami Levy. I will be watching the sales and will post a Rosh Hashana alert if I see a good deal. Of course, if you have a large freezer, you can also start some of your baking or preparing DUMP chicken recipes (for more on DUMP chicken, check out Once a Month Cooking). Remember, after Rosh Hashana, we have 3 more weeks of holidays- the more you do ahead of time, the more you can enjoy Chol Hamoed Sukkot with your family!